In 2017, the Chief Executive Officer of Dangote Groups, Aliko Dangote, and other business operators estimated that the economy lost about N20 billion daily to the lockdown. At that rate, Nigeria’s loses about N7.28 trillion per annum. It also makes importers incur unnecessary demurrage, aiding the diversion of cargo to the more business-friendly ports in the Benin Republic, Togo and Ghana. Apart from the financial holes the gridlock bores in the government’s coffers and individual pockets, there are security dimensions that are potentially dire such that the Nigerian Navy issued a 48-hour vacate order to the tanker drivers on March 7. “Some of the vehicles have been parked on the bridges for two or three weeks with some of them carrying loads,” the Navy said in a statement. “Terrorists and other enemies of Nigeria could easily use this opportunity. If any of the tankers parked along the road is set ablaze, you know what will happen to the rest”, the Navy said. “If the government could create a place outside Lagos, where we can drop our empty containers, the situation will improve,” he said. “I bring ginger from Kano for export and now I did not have money to continue (sic). I met others who had spent six days in the parking area before I came and they are still here. We bath and go to toilet under the trucks and fetch water from nearby filling stations (sic),” he said. Saliu Taofeek is from Ibadan and has spent eight days on the queue. He was working in a bakery before he left to learn driving when he could not make ends meet. He urged the government to come to their aid. “Government should find an alternative place for us to park, they can introduce a call system, where they can call maybe 10 or 20 trucks since the port can take between 50-60- trucks a day,” Taofeek said. For Mohammed Garba, a truck driver from Kano, the joint stakeholders’ task force inaugurated by the government on the situation should be commended for bringing a sort of sanity to the system but a lot still needs to be done. The soldiers do not allow us to park on the bridges any more but that is only at Apapa area. “The soldiers said they don’t want to see any truck on the bridges because the bridges are already expired. 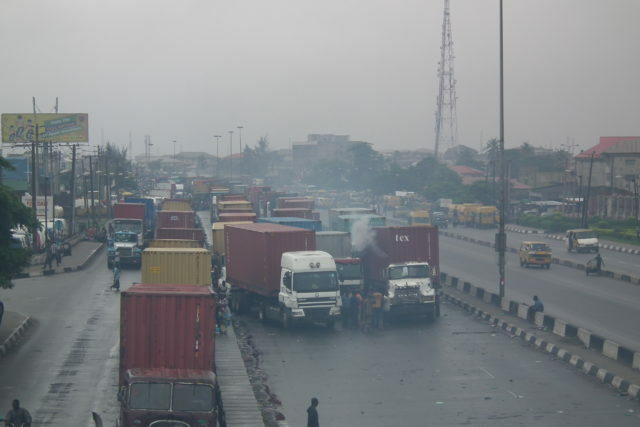 The trucks are also causing a serious hold up at the Apapa side. We are now in the parking area. When your paper is ready they will call you and you get a pass ticket from Navy, they will carry you to Apapa side and then you join the queue to the terminal”. “This place is like house arrest because the area boys used to steal our spare tyres, batteries and gas. About ten vehicles have lost their batteries and we are taking turns to keep vigils at night to check the theft since the police are not protecting us,” he said. The bridges aren’t designed to host heavy static vehicles, and a lack of consistent and thorough maintenance could spell tragedy. Some of the bridges at risk of buckling under the weight of parked heavy-duty trucks are Ijora, Eko, Ojuelegba, Abati Barracks, Stadium and Costain. “When these vehicles are stationary on the bridges for a long time, they have negative impacts,” Fadayomi said.